Bill was born in the Manhattan to John and Mary Jo Young (Brett) in 1965. His father John is retired from the New York Police Department and his mother Mary is retired from the Town of Orangetown town clerk’s office. His parents moved the family from the Bronx to Pearl River in 1977, where Bill and his three siblings; Nora, John and Mary Kate; all attended Pearl River High School. Bill graduated from Pearl River HS in 1983. 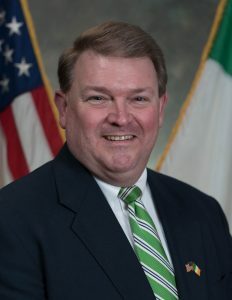 Bill attended Manhattan College where he received his Bachelors of Engineering degree in Mechanical Engineering in 1989 and his MBA in Management in 1993. After graduating from Manhattan College, Bill joined PSE&G, a New Jersey-based utility, where he has held various engineering and management positions. He has been with PSE&G for twenty-nine years and is currently the Manager of Fuel Supply for PSEG Power in Newark, NJ. While at Manhattan College, Bill met his wife, Lois FitzPatrick, who is from Manhasset, NY and a graduate of the College of Mount St. Vincent in Riverdale, NY. They just recently celebrated their twenty-sixth wedding anniversary this past November and reside in Nanuet with their three daughters; Kerry – a Marist College graduate and a kindergarten teacher at the Good Shepard School in Inwood, Megan – a graduate of Boston College and currently in the doctorate of physical therapy program at Northeastern University, and Kiera – a junior at Siena College studying psychology. His daughters have all danced for the Inishfree School of Irish Dance out of the AOH; performing in many shows for Division III. They have competed at the Open Championship level nationally and internationally in Ireland, England and Scotland. Bill has been a member of AOH Division III in Pearl River since 2004 and has been the divisions Financial Secretary for the last ten years. He became vice president of the Rockland County AOH in June 2017. He has been a member of the Town of Orangetown Planning Board twelve years and is a past board member of the Nanuet Black & Gold sports club. He has served on the scholarship committees of both the AOH and Nanuet Black & Gold club and is actively involved in their community sponsored events.